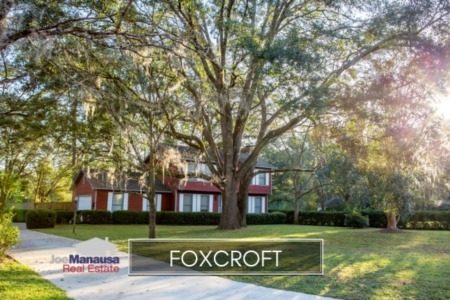 Foxcroft is an immensely popular neighborhood in NE Tallahassee that has been enjoying a powerful rebound over the past two years. Currently, five of the seven homes for sale in Foxcroft are already under contract, and it's likely the other two will be gone shortly. 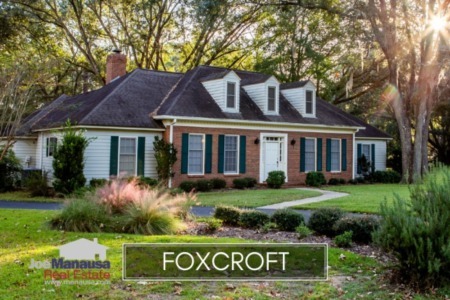 In case you missed yesterday's article, Foxcroft is one of the prized neighborhoods located along the desirable Thomasville Road Corridor on the western edge of Killearn Estates. Buyers have found this area highly attractive for many years, and only the housing bubble stopped it's value growth (for a short period of time). If you think you'd like to buy a home in Foxcroft, make sure you are ready to spring into action when one hits the market, as all properly priced homes in this neighborhood sell very fast. It is important to note that the narrative contained below is for sales through December for all previous years, but through the first two weeks of June in 2016. The graphs and the closed sales table will be continuously updated into the future (meaning bookmark this page if you always want to know the current status of homes in Foxcroft). For the second year in a row, Foxcroft home prices are rising, up 4% from the average of last year's home sales. Thus far in 2016, the ten homes that have sold and closed averaged $202,000. As I have said in the past, when you can find a well-conditioned home in one of these Thomasville Road corridor neighborhoods (like Foxcroft) that is priced below $200,000, scoop it up! Unfortunately, you might not have another chance. The 10 closed home sales in Foxcroft in 2016, coupled with the five that are already under contract, represent a pace of home sales not seen since 2001. To put it mildly, Foxcroft homeowners are doing well this year. Foxcroft home values are up more than 9% so far this year, and they appear to be heading higher. The ten sales this year averaged $115 per square foot. Today, home values are still 16% lower than they were at the height of the housing market in 2006, but are up nearly 37% from the bottom of the market established in 2010. If you were one of the wise buyers in 2010, you have plenty of equity to trade-up if you would like. There is still a substantial upside for today's buyers, as Foxcroft is going to be highly desirable for many more years to come. Foxcroft home sizes typically fall in a range of 1,700 to 1,900 square feet, and this year buyers are choosing the smaller homes thus far. Of course, they have been choosing everything that hits the market, so apparently is the sellers with smaller homes that are driving this metric right now. The ten home sales in 2016 have averaged 1,749 square feet. The following list shows nearly 500 (all) home sales in Foxcroft going back to 1991. I hope you enjoyed our June 2016 update on home sales in Foxcroft, please feel free to drop me a note if you have questions not covered in this report.